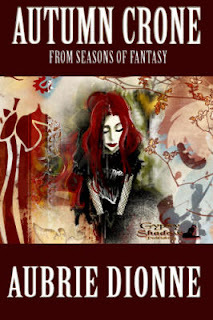 I began reading this series by our own Aubrie Dionne with Autumn Crone and went through the seasons chronologically. The Seasons of Fantasy series is fantasy romance, and love is a key theme. These short stories are heartwarming, and I enjoyed every one of them. Book Blurb: Cursed by her own pride and greed, Crawna has lived a lonely life of seclusion, apart from her love. In a visit to the marketplace, she overhears a young woman about to make the same mistake. Can Crawna convince her of her folly? Review: Aubrie Dionne's Autumn Crone tells the fairytale of Crawna, a woman so prideful she gives up love over wealth. Crawna realizes her mistake and does everything in her power to stop it from happening to another young woman. Lyrical prose and beautiful imagery fill Autumn Crone. Most important of all, the story teaches the lesson that actions have consequences and even a heart of stone can melt. 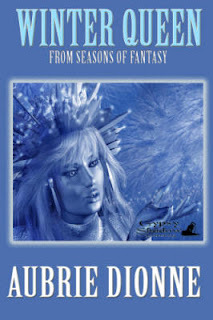 Book Blurb: The Snow Queen has haunted the northern lands for generations using the temptation of a fabled paradise to lure men to their deaths. Can Barrow Tiln, a local farmer’s son melt her heart and set her free, or will she freeze his body and steal his soul? Review: In Aubrie Dionne's Winter Queen, a child's love of a fairytale comes alive when he becomes a young man. Ms. Dionne's poetic prose melts the coldest of hearts. 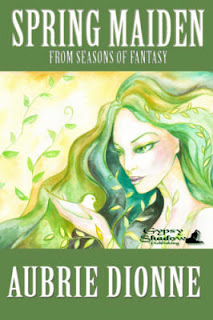 The winter imagery is chilling and vivid, but Winter Queen teaches spring will come, if you only open your heart to it. Book Blurb: Fleeing an arranged marriage, Elana Fallwater trespasses into a ring of toadstools and is spellbound. She becomes the Spring Maiden, eternally roaming the budding woods in a trance. Warren Cutter, an expert huntsman, has been tracking her for years and has stumbled into her clearing. Will he shoot an arrow through her heart, or will she enchant him in her glade? Review: Aubrie Dionne's Spring Maiden explores the land of Spring and its eternal youth. Spring entrances Elana, and she grasps tight on its budding branches. Yet, it is love and reason that reminds her spring, too, must come to an end. Ms. Dionne once again writes with sincerity and beauty in Spring Maiden. Book Blurb: As a love fairy, Kira Flutter has been pairing couples up for centuries. She meets her match when a dashing young sailor arrives at her doorstep asking for his heart's desire. Will she grant him his wish, and usher him into the arms of another? Or will she fall in love and claim him for herself. 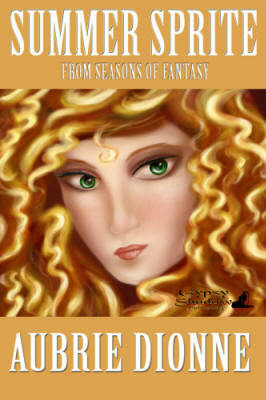 Review: Opposites don't always attract in Aubrie Dionne's Summer Sprite. Kira, a love sprite, enjoys meddling in others' love affairs, but when her own soul mate appears, she doesn't know what to do. With images of the salty sea and beach breezes, Summer Sprite is a true delight. Since my favorite season is spring, I was surprised to find this story of Ms. Dionne's Season of Fantasy series to be my favorite. Thanks so much Cherie! I got got a rejection from Pill hill today for my Shadows and Light story, so this really cheers me up! You're welcome, Aubrie dear! Thanks for letting me read them! I loved these too. I especially liked the winter one.